So fresh, so good. One wheat (sliced), one rye. So, here we are in 2017. I'm not much of a one for New Year's Resolutions, but anybody looking for a good one could do worse than resolve to quit buying bread and bake their own instead. 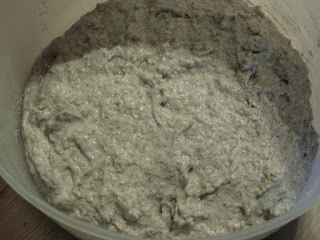 In an earlier post, I got as far as the rye sourdough starter, which is the simple but steadfast and reliable foundation for all sorts of loaves. Today I baked two loaves, each of about 1 kg, one rye and one wheat, and both from the same rye starter. For the two of us, that will do for just about a week. One of the great things about sourdough bread is its superior keeping qualities. We eat up the wheat loaf first, generally starting when it's still warm, and then move on to the rye, which has a higher moisture content so keeps longer and anyway should be left a day at least after baking to be at its best. Fundamental rye starter - very runny. Another excellent thing about sourdough baking is the flexibility of the whole process. Overall, it does take longer than making a yeasted loaf, but the actual hands-on working time isn't much different. The steps that take the time are when the sourdough is busy working its magic and can be tweaked to suit your schedule. Rye production dough in the morning. For both the rye and wheat loaves, I prepare the production sourdough sometime in the evening, with a view to baking the next day. 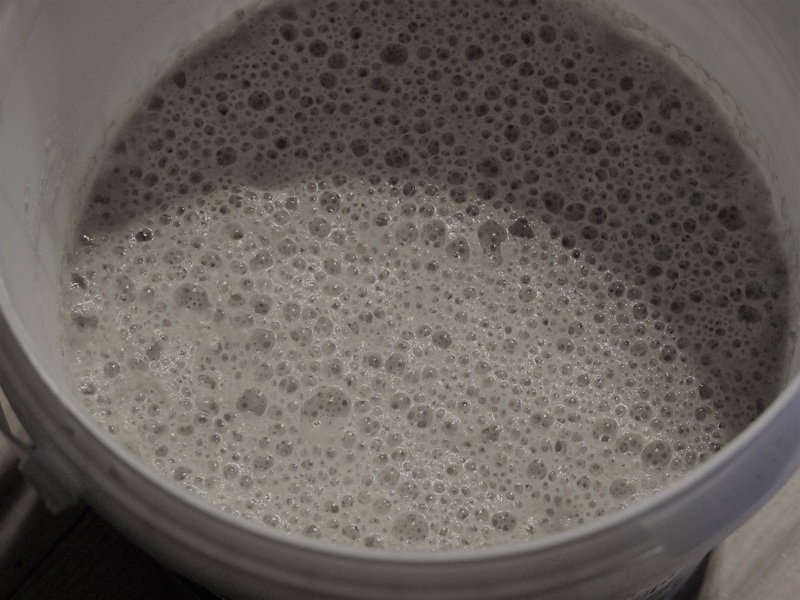 In each case, this involves taking a bit of the starter out of the fridge (where it will keep more or less indefinitely in a dormant state), adding some flour and water to it and mixing it up. The rye production dough, which is effectively the same as the starter, is then covered and left out on the kitchen worktop overnight. The wheat production dough is left in the fridge, as it would be well past its peak if left at a warmer temperature for that length of time. It's convenient then to continue after breakfast. More flour, water, a wee bit of salt and several hours' proving time are all that's needed to transform the production dough into an oven-ready loaf. I shan't be giving recipes here. I found them in Andrew Whitley's excellent books, so it doesn't seem entirely fair to cut him out and give them away for free! 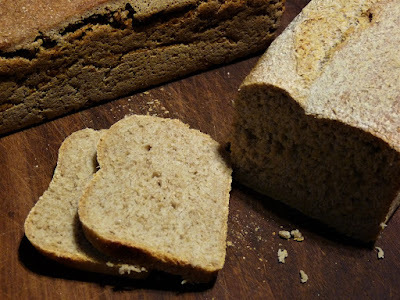 There is a specimen recipe available on the Bread Matters site. I am, however, happy to offer a few tips and observations from my own experience to help smooth the way for anyone getting into this. Here's a classic: It often happens that a sourdough rookie will have their first rye loaf turn out like a brick. This is usually because they have some previous bread baking experience that has created expectations of what the dough should be like. Forget them. They rye sourdough really is meant to be that soft and wet. 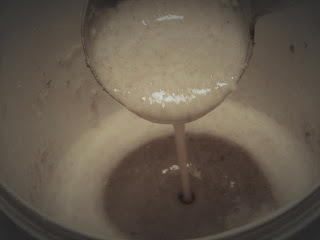 You don't need to kneed it - just mix and pop it into the tin. Sourdoughs in general are softer and stickier than what a yeasted bread baker will be used to, which leads me to my next tips. 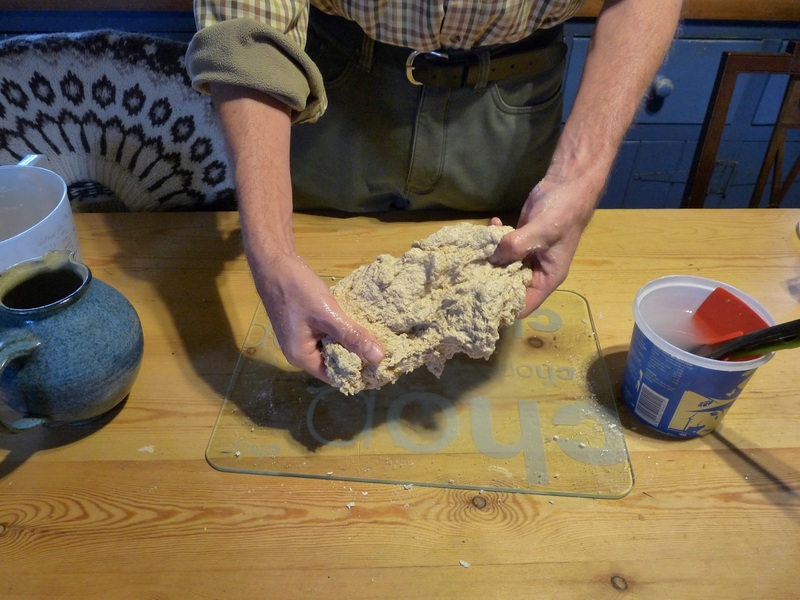 Have a container of water handy when you're working with the dough. A wheat loaf requires kneading, as normal, but the way to stop it all from welding itself to your hands is to keep them moist. Likewise your tools (spatula, dough scrapers) and any surface you intend to set the dough down on before it goes into the tin. Bread in a bag. Keep it moist. The normal kneading technique isn't ideal for a wheat sourdough either, so get into air-kneading. Instead of folding and pushing the dough on to the worktop with the heel of your hand, pick the whole thing up and stretch and fold it instead. 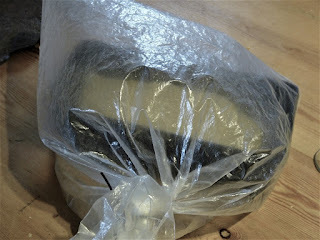 I find this more effective than pummelling for all sorts of doughs and now air-knead exclusively. Finally, the long proving times needed for sourdough loaves mean it's imperative to keep the dough surface from drying out. Popping the whole shebang into a plastic bag, which you can then inflate and close the mouth with a twist tie, makes this easy. Get into sourdough. You won't regret it. It might just change your life. I couldn't agree more - making (and eating) your own bread is one of the greatest pleasures in life! I feel inspired by your post to have another go at sourdough, having had very mixed results in the past, including a solid brick not even the birds would look at. I take your point about different expectations of the dough and the air kneading technique. Definitely time for another crack at it. Yes, do have another go! Sourdough just makes the tastiest loaves and they keep so well.